Wednesdays from 12-6 pm starting June 17 and ending on October 25, 2015 and is located at the green at First Church of Dedham, 670 High Street. Position is 11 hours per week during the season. Pre-season preperatory also required (hours will vary). Salary commensurate with experience. The Market Manager is the "go-to" person for vendors and consumers during market hours, and is the DFM representative on site. The job requires personal confidence and the ability to effectively communicate with a variety of people including municipal employees. DFM relies on the market manager to be its liaison with and between all parties served by the market. The manager's general responsibilities include: fostering community support for the market, helping promote the market, and keeping accurate weekly records of market activities. The manager is required to be on-site at market and available to vendors and consumers the majority of the time. Physical duties required including manual set up/break down of tents and of equipment. Previous farmers market experience and knowledge of local agriculture a plus. 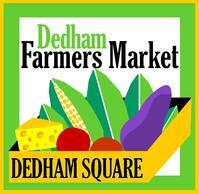 Interested applicants should send a resume to dedhamfarmersmarket@gmail.com or to Dedham Square Circle, P.O. Box 593, Dedham, MA 02027.